Not only am I announcing the winner of the Pump*tastic Sugar Bolus today... but I'm also hosting again!! This is a very special week for us. We will CELEBRATE Sweetpea's Diaversary this week. On April 27th, she will have lived with diabetes for 2 years. I don't know about you... but I think that deserves a celebration! So hosting a super cool giveaway is one way for me to celebrate and honor all of our struggles and victories as we LIVE life with Type 1 diabetes! Not only does this week's giveaway celebrate and honor my Sweet little girl... It also benefits an organization that I believe in. 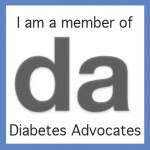 An organization that I support in any way I can... JDRF. Sugarfree Jewellery is the creation of Grace, a D Mama from Canada! Her daughter was diagnosed with Type 1 in 2001 at the age of 5. She uses her amazing talents to create beautiful, hand stamped jewelry! She also just started a blog of her own, Dandelion Wishes! Go on over and say HI! And I thought her work was the perfect fit for THIS giveaway because she's more than just an amazing artist. She believes in giving back. Grace donates 100% of her profits to JDRF! 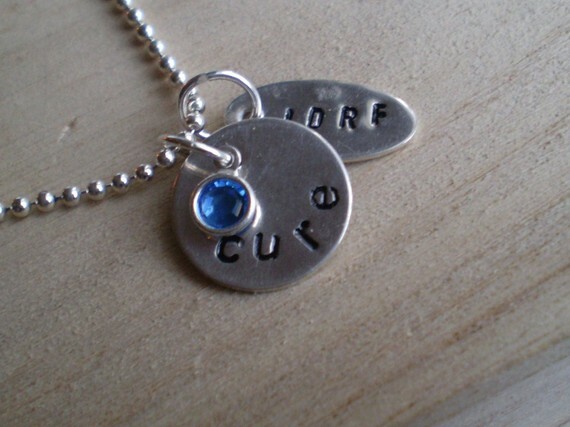 The winner of this weeks Sugar Bolus will win a hand stamped "cure" disk pendant And blue crystal dangle! It can be customized with your date of diagnosis. I wear mine all the time. It is truly a piece of art that I hold close to my heart! Another lucky reader will win a SURPRISE prize that has been hand stamped with love! To find out what this special prize will be- you have to come back HERE on Sweetpea's Diaversary- Wednesday, April 27th! And you will want to come back! Trust me! Of course... I didn't forget about the Pump*tastic winner! A big THANK YOU to Pump*tastic for giving away this great prize! I know you are making one lucky person very happy! Who is it....? KATHERINE! You won the Pump*tastic pump pouch and medi bands!!!! Email me at theprincessandthepump@gmail.com to claim this awesome prize! You have 48 hours to contact me... or I'm keeping it myself. Just kidding! I'll pick a new winner! If you didn't win.... check out the Pump*tastic site to get your own pump pouch and alert bracelets! There are many awesome designs to pick from! AND.... enter this week's Sugar Bolus and help us celebrate Sweetpea's Diaversary! 1. LIKE Sugarfree Jewellery on Facebook! 2. Leave me a comment before midnight Thursday, April 28, 2011. Include your first name (comments left with out a name will be eliminated). LOVE LOVE LOVE this prize!!!! LOVE THIS....LOVE IT LOVE IT LOVE IT! And so cool that you've already found a dx twin!!!! Tweeted! Well, I retweeted Misty's tweet. That still counts, right? I liked her on facebook! What a great idea. I love it. Oh, so pretty! I'm off to "like" her FB page now. Thank you! Thank you, Hallie! 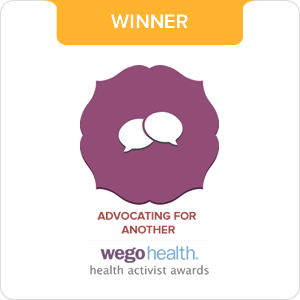 We are so grateful to win your Pump*tastic Sugar Bolus prize. Liked Sugarfree Jewellry on FB. Sherry - shared your giveaway details on FB. Love it! Off to check out her FB page! Just "liked" her page on FB! I really want this!!! I wear the Cure Diabetes bracelet everyday and it often sparks a conversation where I am able to educate someone. I would wear it everyday! Shared on FB. Liked on FB. Don't tweet yet :) thanks for the great contest. What a beautiful giveaway! Please enter me! I "liked" it on FB. Also, how cool that the last prize went to the one who shares the same diagnosis date! Nicole D. LOVE!! 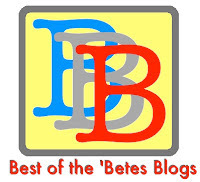 I'm new to all this (daughter as diagnosed on 1/11/11 - my birthday)...all these blogs are awesome!! So excited about Sugar Free Jewelry! 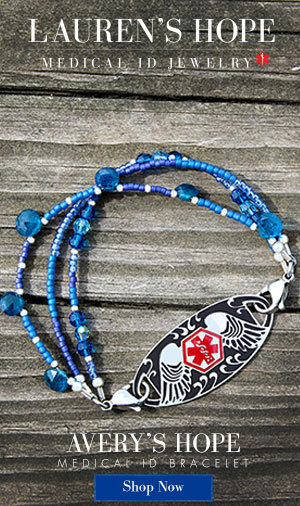 Thanks for sharing this beautiful jewelry with us and offering a necklace as a sugar bolus prize! Oh my goodness. I LOVE this necklace. Count me in! This prize is fantastic! I would LOVE to a win! Thank you thank you! I love Sugarfree jewellery! 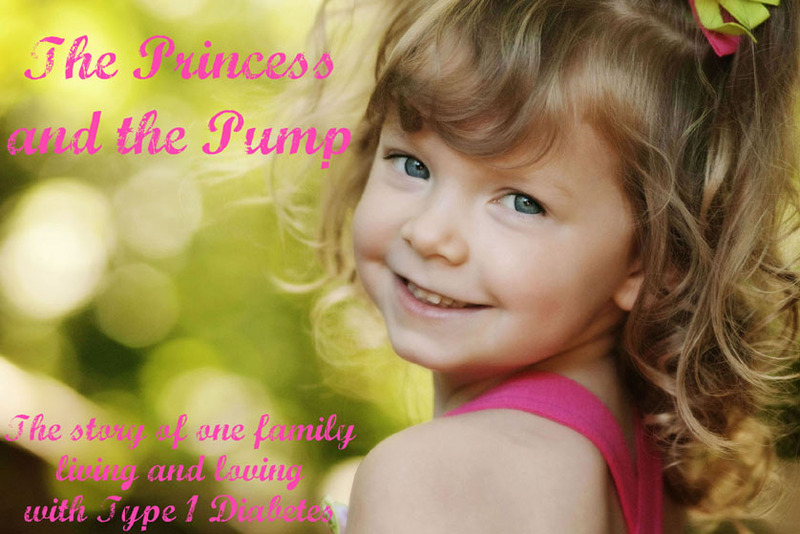 http://www.theprincessandthepump.com/2011/04/sugarfree-giveaway-and-pumptastic.html Click to win! 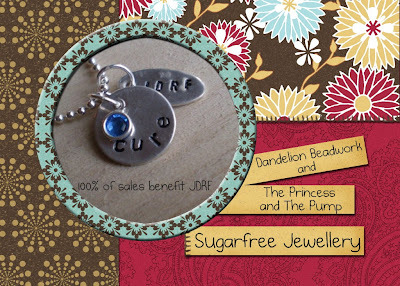 I also liked "Sugarfree Jewellery" on facebook as well! You are simlpe the best Sugar Mama eva! This necklace is really quite pretty. I just think you are fabulous for all you do to lift the DOC's spirits, Hallie. Thank you! What a great way to honor Sweetpea! If I am fortunate to be the winner...fingers crossed...I would wear this with pride. Love it! I LOVE that necklace!! Thanks for sharing that page.. CUTE stuff! Facebooked liked them and here is my comment - I would love to win the necklace! Oh, the necklace is so pretty! I "liked" Sugarfree on Facebook. A very special necklace indeed!! I would love this necklace!! Please enter me! This is an awesome prize! Thanks so much for all you do! I've really enjoyed reading your blog since finding it a few months ago. Great necklace. If we win we will wear it with pride. I've never seen these necklaces...enter me! Tweeted about it!! Love this prize!!! I would love to win this for my daughter! Thanks you! enter me please - I HEART the necklace. Enter me please - and be sure I win because I want that so bad!!!!!!! Damn can you tell I really want to win?? This is a beautiful prize, I hope I win. LOVE it. "LIKED" it & TOTALLY WANT! I just realized I never entered as I was writing Joe's b-day post! I would love to win one!!! I LOVE this stuff! :) I want some for me and Emma. I will be ordering a variety! Love it! Enter me to win! Love it!! I'm a D mama & my son's one year Diaversary is tomorrow. Blogged it in my "Good Friday 4/29" post. I liked sugarfree jewelery on facebook! I never like things on facebook. But I want to win...and I love you so much, so there is that. So pick me. Choose me. You had me at necklace! I hope I'm not too late! (It's 11:35 here. lol) Nothing like waiting until last minute!